Tisk tisk. They’re talking about cleome or spider flower, a bloom I think is exotic and jazzy. For me it was love at first sight. I’ll be the first to concede the leaves and flowers are pungent, the stems are covered with spines, they are sticky, and you never know where they will germinate. But the flamboyant purple, pink and white blooms are spectacular and I’ll overlook any shortcomings these plants have. Let me count the ways that I admire this oft-criticized and maligned flower. 1. Heat tolerant. 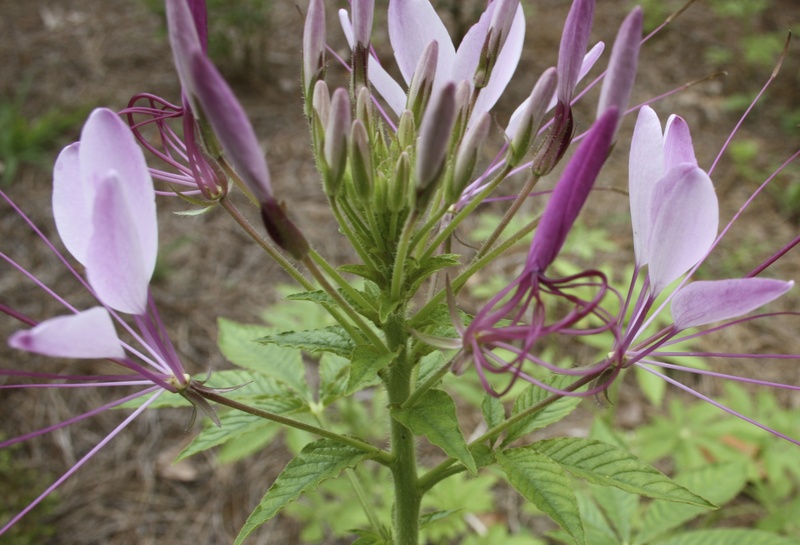 Cleome scoffs at high temperatures and brings welcome color to the borders until first frost. 2. It’s free. That’s the beauty of a self-seeder. 3. Fun surprises when the babies appear in the borders. 8. They pull up easily. Advice: Water occasionally to prevent leaves from drying. Plant in established borders so other plants will support the stems. New varieties like Senorita Rosalita are more compact and have no odor, nor spikes. They are sterile however. No fun there. This entry was posted in Horticulture and tagged blooms, Cleome, Flower, Flowers, gardening, Spider Flower, Tidewater region of Virginia, Virginia by Annie. Bookmark the permalink. My sister is terribly allergic to cleome. She breaks out all over her arms with a severe itchy rash if she touches the plant. Have you ever heard of such a thing? Sigh. Yes, recent DNA studies link the plant to the mustard family. Contact dermatitis in some people can result from contact with antigens in the plant. Although I’ve never had a problem, I wear gloves when I pull it out. I agree it is a beautiful plant …. No excuse not to grow it as it self sows and takes care of itself. Keep up the good job of informing everyone of great horticulture pearls.